GANGNEUNG, South Korea (AP) — The moment was too important to be overshadowed by a loss. No matter the final score. The Korean women's hockey team, the first in Olympic history to combine players from North and South, was routed 8-0 by Switzerland on Saturday night in its debut game, outshot 52-8 in a matchup that could have been far worse if not for the goaltending of Shin So Jung. The poor showing didn't stop the sellout crowd from cheering throughout much of the game, the chants led often by North Korea's famous cheering group, and it didn't lessen the import of the event. "I think a unified one is stronger than two divided ones ... If North and South Korea will send unified teams on sports and all other sectors, we'll have good results," North Korean player Jong Su Hyon said after the game. 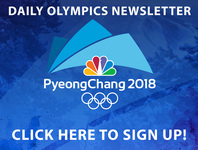 Fans unfurled a large banner reading "We are one" after the game and then IOC President Thomas Bach and South Korean President Moon Jae-in joined the powerful sister of North Korea leader Kim Jong Un, Kim Yo Jong, and Kim Yong Nam, North Korea's nominal head of state, for photos with the team. The dignitaries walked to the Korean bench, taking turns talking to players still standing on the ice. After a photo together, each of the Koreans shook hands with the three men while Kim Jong Un's sister watched. It was a raucous and historic night mixing sports and politics on an international stage for a second straight night in this remote region of South Korea. The game came just 24 hours after an extraordinary opening ceremony filled with signs of unity between the two rivals. And like the ceremony, North and South leaders spent long moments in close proximity. The two North Koreans are on a landmark visit to the South amid a flurry of abrupt reconciliation steps, and both attended the opening ceremony before having a luncheon with Moon at Moon's presidential palace earlier Saturday. The North Koreans have invited Moon to visit Pyongyang in what would be the third inter-Korean summit talks since their 1945 division. Fans roared every time a Korean got the puck on her stick, and Han Soojin nearly put the team on the board with a shot from the left circle that hit the crossbar early in the first period. North Korean Jong Su Hyon had one of Korea's three shots in the opening period. Still, the Koreans were playing the world's sixth-ranked team. Alina Muller had a hat trick for Switzerland by the end of the first period and added a fourth early in the second. Coach Sarah Murray played three North Korean forwards as required in the deal that created the team; she had to scratch three of her South Korean players. "Obviously, it is tough to lose. Nobody likes losing, especially me ... I think they were nervous," Murray said. "Coming on first such a big crowd and the first game on Olympic stage. I think in the first period we were nervous and it was hard to come back from that." South Korean player Ko Hyein said: "We had a tight game at first in the first period, but our mental toughness wasn't really good so we lost our posture after suffering the first goal. But we'll make up for that weak point for the next game." Hundreds of spectators lined the streets outside Kwandong Hockey Center before the game, chanting and waving small "unification flags" amid gusting, chilly winds. One man held up a sign that read, "The peace of all mankind." "We have to be unified (with North Korea). Politicians must let the Korean people meet and get together continuously," said Park Sung-uk, a 48-year-old office worker who attended the game with his family. "I just want the unified team to do well in these Olympics." Fielding the joint hockey team was one of the key agreements reached after several rounds of talks on how to cooperate during the Olympics, which run through Feb. 25. Athletes from North and South paraded together during Friday night's ceremony in the same white parkas, marching under a single "unification flag" depicting an undivided peninsula. It was their first joint march since 2007. The Korean team, guaranteed a berth in the Games as the host nation, is not expected to win a medal. But its debut against Switzerland, which won bronze in the 2014 Olympics, had historic significance and symbolized fledgling unity between the rivals split along the world's most heavily fortified border. The North initially had no athletes coming to the Olympics, but the International Olympic Committee allowed 22 as special entries. Twelve female hockey players joined the 23-person South Korean team. The players have been the subject of intense scrutiny and the team was thrown together only two weeks ago, with limited time to practice. Two players, one South Korean and the other North Korean, appeared on the opening ceremony and climbed stairs together with the Olympic torch that they handed to Olympic champion figure skater Yuna Kim. There was early criticism in South Korea that the new players would throw off team chemistry and cost South players time on the ice after working together for months to shine on the sport's biggest stage. The team's Canadian coach initially expressed frustration over a team assembled so close to the Olympics, but she has recently said she is happy with her new players on a team she says now feels like family. The Koreas often use sports to find a breakthrough in their strained relations. The ongoing rapprochement mood flared after Kim Jong Un said in his New Year's Day address that he was willing to send an Olympic delegation. Moon, a dove who wants to resolve the nuclear standoff diplomatically and peacefully, quickly responded to Kim's outreach by offering talks. Many experts say Kim's overture is intended to use improved ties with Seoul as a way to weaken U.S.-led international sanctions toughened after its series of big weapons tests last year that include its sixth and largest nuclear test explosion and three intercontinental ballistic missile launches. Warming ties between the Koreas could complicate Seoul's ties with Washington, which wants to maximize its pressures on Pyongyang.